I tried to grow rainbow chard this summer. It had obviously been watching the Olympics this summer because it bolted. Immediately, not pausing for breath, it simply sprinted right past edible and grew gloriously tall. Which was a shame as I was very much looking forward to trying it. I mean, just look at it, isn’t it beautiful? As far as flavour goes, I am very willing to admit that it’s a leafy green vegetable. It’s good but it didn’t set my world on fire. However, I have very low iron levels so I need all the leafy green veg I can get and I am always willing to eat something simply because it’s pretty! – Place the flour, yeast and salt in a large bowl and mix. – Mix until it forms a dough then turn out to knead on a floured worksurface for about 10 minutes or until smooth and elastic. – Place in an oiled bowl and cover, in a draft free place, and leave for one hour or until doubled in size. – Knock it down and divide the dough into two. 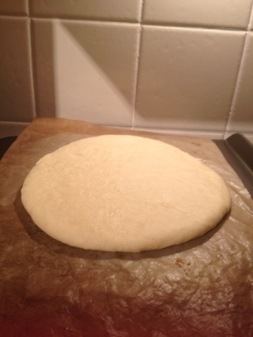 – Shape each ball of dough into a roundish pizza shape and place on a baking tray. – Cover with a teatowel and leave in a warm palce to rise for half an hour. – In the meantime heat the oven to gas mark 7/210C. – In a large frying pan, preferably with a lid, heat some butter until just browning. 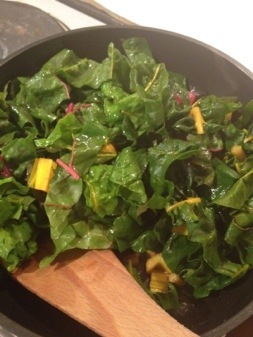 – Add the chard, with a sprinkle of salt, and stir a little to coat with the butter. – Turn down to a low heat and place the lid on. 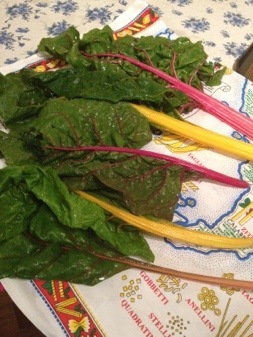 Cook for 5 minutes until the chard is wilted. – Place half of the creme fraich on each pizza and spread out to the edges. 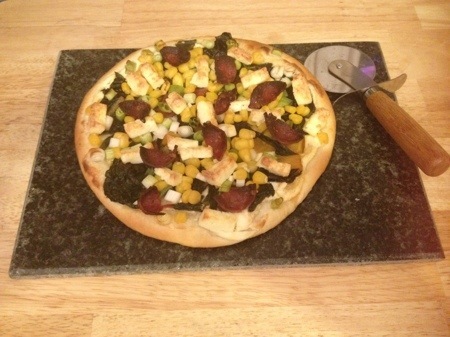 – Add the cooked chard and then the other toppings. – Place in the oven on the top two shelves and bake for 25 minutes, swapping trays over after 10 minutes. Hi! Glad you’re enjoying the blog. My one tip would be to enjoy what you’re blogging about. Write about what you enjoy and those who read it will enjoy it to. Be honest and remember, not everything has to be perfect! It’s totally ok to admit that you didn’t like something or couldn’t do something. We can’t all be experts from day one. The interesting part is learning as you go!